ALLDERBLOB day short story contest winner! In the annual tradition that has come to be known as ALLDERBLOB day, there are always winners and losers. 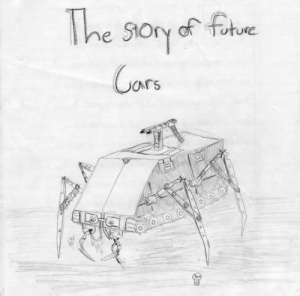 Each year, we hold a short story contest on the theme of “Car of the Future” and each year we have been shocked and disappointed at the turnout. In short, no one has picked up our challenge in the past. This year, we changed tactics. We sought out writers we know well and asked them to submit. We upped the prize, too: instead of our usual 12 cents (in pennies), which to us seemed a reasonable reward (they’re just words after all: words are cheap, right?) we offered a first prize of brunch at the Only Cafe. IN THE GRIM DARKNESS OF THE FUTURE, there is nothing but war. The only tribe that is not in the great war is a tribe called the Biomorphs. They are a rapidly evolving race. Their goal is to stop the great war and bring peace to the earth once again. Their great technology is their advantage, along with their unique fighting style. The reason they are so advanced is because they’re from the planet Mars. They have a fast technology. their vehicle is nothing like a car. Their vehicles are called Vortextrons. Let me tell you about them: their treads; their hoverflaps; their spider-like legs and their vast variety of weapons. THE TREADS ARE POWERFUL. They have five wheels giving them extra pull. They have a massive hard-drive main computer. One hundred titanium spikes line the two sides, to that the Vortextron can almost climb a vertical slope. The treads are caterpillar style, the most common type of power treads. Their length is 50 feet. Twenty power ventilations give them up to 1000 horsepower. THE HOVERFLAPS ARE NOTHING but the treads flipped up. The average push-power is one thousand thousand. Bio-magnetic cords attached give extra push velocity. The hoverflap is the second most powerful part of the Vortextron. Most people will tell you it’s their favourite part. AS FOR THE LEGS, if you’ve ever seen the movie “The Wild, Wild West,” you will recognize them from that huge tarantula machine. The legs are the most helpful part on the whole Vortextrong. The legs are 60 feet tall. Bicycle chains [at last, he gets to the good part! –ed.] pull the legs in a smooth operation. Self-operating oil machines make the Vortextron ultimately noiseless. The spider legs can pierce the hardest rock. AS FOR THE VORTEXTRON’S DEFENCES, it has many weapons. It has a missile launcher implanted into the back hatch. It also has some laser semi-cannons on Both sides. It has a plasma cannon on the rear stabilizer. Finally it has a plasma fire cannon under the treads. I HOPE YOU ENJOYED the explanation. Tooker Gomberg would find our silent treatment a bore. Sorry Tooker. We’re thinking of you today, on and around the anniversary of your disappearance. You are currently browsing the the ALLDERBLOB blog archives for March, 2008.